Nate Harlow would love to be lucky, just once! He'd like to win a prize, get picked first, call a coin toss right, even! But his best friend, Genesis Beam (aka Gen), believes in science and logic, and she doesn't think for one second that there's such a thing as luck, good or bad. She doesn't care what names the other kids call them. She cares about being right, about saving the turtles of Paradise Beach, and she cares about Nate. Then, on his birthday, at the Goofy Golf mini-golf course, Nate is struck by lightning -- and survives! Suddenly baseballs are drawn to his bat - popular kids want HIM on their side. It seems the whole town of Paradise Beach thinks Nate has the magic touch. But is there room for Gen in Nate's lucky new world?Lucky Strike tells the unforgettable story of two vulnerable outsiders and what luck is really all about. Nate Harlow is the unluckiest boy in town. His toast is always burnt, and he can never call a coin correctly. He takes pictures of lost shoes, hoping that one day he can reunite a pair, that maybe that will be good luck. Then he's struck by lightning on his birthday and everything turns around.I liked that LUCKY STRIKE was ambiguous about whether there was anything magical happening. Nate's luck (good and bad) strains credulity, as do other events in the novel, but there is no concrete statement Nate Harlow is the unluckiest boy in town. His toast is always burnt, and he can never call a coin correctly. He takes pictures of lost shoes, hoping that one day he can reunite a pair, that maybe that will be good luck. Then he's struck by lightning on his birthday and everything turns around.I liked that LUCKY STRIKE was ambiguous about whether there was anything magical happening. Nate's luck (good and bad) strains credulity, as do other events in the novel, but there is no concrete statement that it is all real or all imaginary. After all, as Gen's mother points out, much of the changes in Nate's life could come from his increased self-confidence. There's a nice balance of possibility.Pre-strike, Nate is best friends with Genesis "Gen" Beam and firm in his solidarity with her as the two biggest losers around. Post-strike, he is excited by his new opportunities to make friends and lashes out when Gen's lack of social skill makes it harder for him to fit it. It's hard to see a nice kid succumb to popularity like that, but it is believable that Nate wouldn't know how to handle all of the changes in his life gracefully. I did find it slightly awkward that LUCKY STRIKE starts switching to Gen's point of view at this point when the beginning is firmly in Nate's point of view. However, I did like that both friends get their say.The messages of LUCKY STRIKE are pretty simple: good friends stick with you through thick and thin, and fancy new things aren't always better than what you had. There's also a good exploration of the kind of jealousy that unwarranted good fortune can engender. It's not groundbreaking stuff, but it is presented charmingly. I particularly liked the environmental element of LUCKY STRIKE. Gen is passionate about protecting the loggerhead turtles that nest on the beach.Young readers will enjoy Nate's reversal of fortune and discovery that some things are more important than luck. LUCKY STRIKE is a cute, almost magical realist, read that does hit some deep notes. Lucky Strike is a light-hearted tale about a boy whose fortune changes when he miraculously survives being struck by lightning. Through the use of magical realism, Bobbie Pryon also explores complex themes such as friendship, bullying, and what luck really is. While Lucky Strike might a departure from Pyron’s more serious works, it remains thought-provoking and well written.Magical realism might seem like a contradiction. After all, the one is about impossible events and the other depicts events Lucky Strike is a light-hearted tale about a boy whose fortune changes when he miraculously survives being struck by lightning. Through the use of magical realism, Bobbie Pryon also explores complex themes such as friendship, bullying, and what luck really is. While Lucky Strike might a departure from Pyron’s more serious works, it remains thought-provoking and well written.Magical realism might seem like a contradiction. After all, the one is about impossible events and the other depicts events that could be true. Pyron manages to pull it off, by creating one character who wholeheartedly believes in luck and another character who accepts only the laws of probability and logic. Nate carries around a rabbit’s foot, wishes on birthday candles, and forever hopes for his misfortune to change. In contrast, Gen persists in calculating chance, persisting in the belief that if one tosses a coin one hundred times, the odds are one will get heads about half the time.Pyron also successfully walks the tightrope between magic and realism, by entrenching readers in the realistic world of the sea, fishing, and turtleheads, while at the same time dipping into the improbable world of being struck by lightning, living to tell the tale, AND being blessed with a Midas Touch. On the one end, Nate and Gen spend each spring visiting the beach and protecting turtle eggs. On the other end, Nate finds himself surrounded by more friends and enemies than he knows how to handle, due to his mysterious ability to pick winning numbers and tickets.Finally, Pyron manages to pull off a magical realism tale with a style that relies on exaggeration. Open to any page and you’re bound to find a few examples. To illustrate, page one tells us that Nate’s hound dog had been snatched up by a tornado “doghouse and all” never to be seen again. Moreover, Nate had never “in the history of his eleven years on God’s green earth” won a prize. Around the midpoint, we’re told about Nate’s visit to a carnival. He plays a game where one has to knock down four miniature clowns with a ball. After Nate successfully strikes the first three clowns, he could have sworn the fourth “tried to hide behind the other clowns”All of the above makes for a highly entertaining and fun tale, but Pyron is also a master at creating fiction of depth. There’s a message about friendship. When Nate gains popularity for the first time, he forsakes his previous friends. As a twist on this common mistake, Pyron has Gen push herself out of her comfort zone to find others who need friends. There’s a message about bullies. Not long Nate forsakes his previous friends, he ends up having to choose between them and a gang of boys whose skills lie in taunting others. Finally, there’s a message about luck. Like a person who has won the lottery, Nate is catapulted into the center of attention after being strike by lightning. Sometimes though, fame isn’t everything one expects, wants, or needs.With each new novel, Pryon shows herself adept at writing for different age groups and in diverse genres. I first encountered her writings in 2011 when I reviewed A Dog’s Life and The Ring as part of a virtual tour. It’s been an equal delight to read Lucky Strike, so much so that I’m already looking forward to her next book. Loved this book. Great story about friendship, the power of hope, and two kids whose lives are changed when one of them gets struck by lightning. Nate is the most unlucky person ever until he survived being struck by lightning. After that his luck changes to good…always. That is good, right? Sometimes good luck is worse than bad luck… and Nate’s good luck may not be so great for his friend, Gen.I loved the characters in this book. They were so real and likeable. I grew up in a small town where e Loved this book. Great story about friendship, the power of hope, and two kids whose lives are changed when one of them gets struck by lightning. Nate is the most unlucky person ever until he survived being struck by lightning. After that his luck changes to good…always. That is good, right? Sometimes good luck is worse than bad luck… and Nate’s good luck may not be so great for his friend, Gen.I loved the characters in this book. They were so real and likeable. I grew up in a small town where everyone knew my dad who had been raised here. It was rough growing up because I couldn’t get away with anything, but it was also nice to be part of a community. My dad was in construction and times were tough growing up financially. So I could relate to the struggles of the people in this community and also how they came together.I give this book 4.5 out of 5 clouds. This review is also available on my blog, Read Till Dawn.I'm beginning to feel old. Yes, old. And don't laugh at me, okay? Sixteen-year-olds are allowed to feel the effects of growing up just as much as adults - in fact, we go through more changes in a shorter amount of time than you do! So when I read a Middle Grade book, one that is targeted to an age group that I was a part of only four years ago, I get a bit nostalgic. I get nostalgic for the days when I was easily wowed, when plots never fe This review is also available on my blog, Read Till Dawn.I'm beginning to feel old. Yes, old. And don't laugh at me, okay? Sixteen-year-olds are allowed to feel the effects of growing up just as much as adults - in fact, we go through more changes in a shorter amount of time than you do! So when I read a Middle Grade book, one that is targeted to an age group that I was a part of only four years ago, I get a bit nostalgic. I get nostalgic for the days when I was easily wowed, when plots never felt reused or simplistic or - perish the thought! - boring. Now that I'm older, and have read so many books, I am much more particular about the books that I read. My eyes aren't the fresh eyes of a book-loving seventh grader; they're the critical eyes of a well-read soon-to-be Senior in high school. Yes, I realize I'm exagerrating. But I'm in a reading slump right now, so this is how it feels. In a few weeks I'll be bright-eyes again, but right now the world is a well-trodden place where there is nothing new to bring to the table.I'm sad Lucky Strike didn't bring me out of my slump, but I just didn't like the characters enough to enjoy it very much. Nate didn't really win me, and I especially didn't care much for the way he treated Gen. He's such a fair-weather friend that as soon as he gets struck by lightning, he hoofs it over to the popular kids' side. Haha, he's a "fair-weather friend" who leaves after he gets "struck by lightning!" I don't know why, but I think that's hilarious. Puns aside, though, Nate was rather an anomaly. Descriptions of Nate and Gen's past together depicted him as this great friend who stuck by Gen through thick and thin. Then we're supposed to believe that he ditches her in a really cruel way (by standing her up, barely apologizing, and then calling her a weirdo in front of all of their classmates). Then at the end - well, I won't spoil it for you, but I bet you can guess. Nate's supposed to be this nice kid who went a little popularity crazy when his luck changed, but I just don't buy it. I wish I did, though.As for Gen, I didn't really love her either. I mean, I liked her more than Nate and I felt bad for her when he was mistreating her. But I'm so sick of the "socially disconnected" depiction of smart people that I didn't really like her as much as I could have. How come the smart person always has to be the weirdo? As a smart-ish person myself, I know this isn't always the case - when you're born, God doesn't decide between giving you scholastic or social aptitude. Being able to process large numbers in your head (definitely not a gift God has given me) does not require you to spit them out like a calculator in the middle of conversations. Caring about turtle eggs on the beach does not mean you sit on the beach 24/7 and forgo having fun with people your own age (and species).The plot idea is a fun one, and has a lot of potential. Byron focuses on the reactions to Nate's new luck: I already discussed Nate's less-than-ideal reaction, but the far more interesting aspect of the story is everyone else's reaction. Any time one person seems to have an advantage in this world, we seem to break into two groups: the beggers and the haters. The beggars are the people who swarm Nate, asking him to do things for them or play on their team or come ride in their fishing boat. They want some of Nate's luck to rub off on them, so they scurry to stay on his good side. Everone else despises Nate for being so successful. When he and his grandfather have a run of fabulous luck, the other men of the village become bitter that Nate's grandfather is getting everything. They become bitter, behaving meanly to both Nate and his grandfather, because they are swept away in the feeling that an injustice is being done them.Honestly, the more I think about it the less I liked Lucky Strike. There's nothing so wrong with it that I would consciously refuse to recommend it, but there's also nothing so positive about it that I would go out of my way to suggest it to others. I may hand it off to my middle grade-aged brother if he seems interested, but I won't push it onto him. And who knows, he may like it much more than I did. Ask anybody in Paradise Beach who is the unluckiest of them all, they’d unanimously offer the name, Nathaniel Harlow.Nate is so unlucky when he tries to toast some bread, it doesn’t come out burnt, the toaster shorts out instead. Every box of cracker jacks is consumed with no prize in the bottom.So who would be the unlucky person to get struck by lightning on his eleventh birthday but Nate. Yep. while playing goofy golf, a bolt came down and blew him clear oot of his favorite red sneakers.Now th Ask anybody in Paradise Beach who is the unluckiest of them all, they’d unanimously offer the name, Nathaniel Harlow.Nate is so unlucky when he tries to toast some bread, it doesn’t come out burnt, the toaster shorts out instead. Every box of cracker jacks is consumed with no prize in the bottom.So who would be the unlucky person to get struck by lightning on his eleventh birthday but Nate. Yep. while playing goofy golf, a bolt came down and blew him clear oot of his favorite red sneakers.Now that’s not the way it was supposed to work. For the first time ever, when Nate made a fervent wish and blew the candles out on his birthday cake, they all went out. Not one flame stayed lit. Shouldn’t that mean his wish had come true? His luck had changed? I wouldn’t call lightning zapping him lucky.Perhaps his luck did change though. He did survive to see more birthdays. And then more lucky things began to happen to Nate and soon he was the most popular person in Paradise Beach.But is he truly lucky? His best friend, Genesis Beam, doesn’t think so. She’s been friends with Nate for a long time and being a science geek, she doesn’t believe in luck. She just tells him the odds are in his favor for good things to happen. We shall see.Nate is a delightful boy. He remained positive even though he was unlucky. He never gave up hoping for better. And his friend Genesis. She’s such a cute thing. Both are the outsiders. The ones the others bully and make fun of.I was worried about their friendship when Nate became popular. I didn’t want him to lose such a loyal friend or abandon their plight to save the sea turtles. Childhood friends are precious and can last a lifetime.Lucky Strike is a gem. Friendships are tested and new ones are forged. It’s a story of learning to see what’s in front of you and hold tight to it. Sometimes wanting something more shows you’ve had it all along.My son read this after I did. He’s a bit older than the recommended reading age for this story but he loved it too. We talked about luck and friends, family and how things change over time. Our reminiscing was another gem I discovered from sharing this book with him and we both feel “Lucky” to have read it.I received this book for my honest review. Nate is unlucky, and he has been unlucky for as long as he can remember. His grandfather doesn't have much in the southern fishing town where they live, but when he takes Nate to mini-golf for his birthday, the unthinkable happens -- Nate is indirectly struck by lightening and his luck changes dramatically. Lucky Strike is your basic "outcast becomes popular, abandons his real friends for the new cool kids, and eventually learns that friendship and family are everything" story. Though I enjoyed Nate is unlucky, and he has been unlucky for as long as he can remember. His grandfather doesn't have much in the southern fishing town where they live, but when he takes Nate to mini-golf for his birthday, the unthinkable happens -- Nate is indirectly struck by lightening and his luck changes dramatically. Lucky Strike is your basic "outcast becomes popular, abandons his real friends for the new cool kids, and eventually learns that friendship and family are everything" story. Though I enjoyed Nate's BFF Gen, gifted in all things practical and a lover of science and math, as an interesting foil to his "luck is everything" perspective, I couldn't find much to love about this book. The pacing is painfully slow, with not much going on in terms of plot or character development for the middle 60% of the book. Both the Nate is so super lucky and the Nate abandons his friends sections could have done without about 75 pages combined. And the turtles, which are meant to drive the plot to its climax, seem to come from no where after a one line mention earlier in the book. Writing-wise, I found the Southern quirkiness and sayings trite rather than reverent. Might appeal to 4-6th grade audience, but lacks the sophistication many upper-elementary books have in terms of avoiding an obvious ending. Lucky Strike (not to be confused with Lucky Strikes, which I read a few days ago) is basically a story about friendship--what happens when the cool kids start to like you (even if it's for the wrong reasons)? Nate and Gen are quirky and dorky but fit together...but when Nate finds a weird kind of fame after being struck by lightning, their friendship becomes strained, and Nate discovers that luck and fame aren't really all they're cut out to be. Nothing particularly hard-hitting or deep in this Lucky Strike (not to be confused with Lucky Strikes, which I read a few days ago) is basically a story about friendship--what happens when the cool kids start to like you (even if it's for the wrong reasons)? Nate and Gen are quirky and dorky but fit together...but when Nate finds a weird kind of fame after being struck by lightning, their friendship becomes strained, and Nate discovers that luck and fame aren't really all they're cut out to be. Nothing particularly hard-hitting or deep in this one; it's cute and short and will be great for reluctant readers. 3.5 Good story about a kid who thinks he's unlucky until he survives a lightning strike. His luck changes, but he comes to see it may not really be all that "lucky". When his best friend,who he has blown off since he's been asked to hang with the cool kids, gets struck by lightning too, he realizes what true luck is. I liked the Florida setting & side story of the conservancy of the loggerhead turtles. This book is funny, has great characters, an interesting story, and some great science connections. It is perfect for any elementary teacher looking for an interesting and fun book to read with students to discuss theme, symbolism or characters. Or lightning, electricity, string theory, conservation and turtles.The two main characters are unique and interesting. They have such a generosity of spirit that the reader is immediately on their side. Nate photographs single shoes "mysteriously separat This book is funny, has great characters, an interesting story, and some great science connections. It is perfect for any elementary teacher looking for an interesting and fun book to read with students to discuss theme, symbolism or characters. Or lightning, electricity, string theory, conservation and turtles.The two main characters are unique and interesting. They have such a generosity of spirit that the reader is immediately on their side. Nate photographs single shoes "mysteriously separated from their mates." At first, he brought all the single shoes home hoping to find the mates, but that stopped when the trailer he shares with his grandfather was overrun with shoes. Nate believes that lost shoes are important, and he has faith that eventually the other shoe will be found. He has that same faith in people and experiences. His best friend Genesis is very smart, dedicated to, and sacrifices for, turtles, and has a wonderfully supportive and funny family. And who knew that sand castles were dangerous to the loggerhead turtles coming up on the sand to lay eggs? Nate has never been particularly lucky. His parents died when he was four and his dog was carried away in a tornado. His only friend, Gen, is the smartest - and quite possibly the strangest - girl in Paradise Beach. Both Nate and Gen are subjected to bullying from their classmates, but they don't really care, living by the motto "Weirdos and losers stick together through thick and through thin." All that changes, however, when Nate is struck by lightning on his 11th birthday. Suddenly, his life Nate has never been particularly lucky. His parents died when he was four and his dog was carried away in a tornado. His only friend, Gen, is the smartest - and quite possibly the strangest - girl in Paradise Beach. Both Nate and Gen are subjected to bullying from their classmates, but they don't really care, living by the motto "Weirdos and losers stick together through thick and through thin." All that changes, however, when Nate is struck by lightning on his 11th birthday. Suddenly, his life is filled with good luck and his former tormentors want to be his friend. Instead of helping Gen protect the loggerhead turtles as they arrive on shore to lay their eggs, Nate begins to spend all his free time with the boys. It isn't long, though, before Nate begins to wonder if too much good luck might not be such a good thing after all. Is there a way to reverse the effects of being struck by lightning? There's only one person Nate trusts to have the answer.Interesting story about friendship with likable characters that will make students think about what it really means to be lucky. 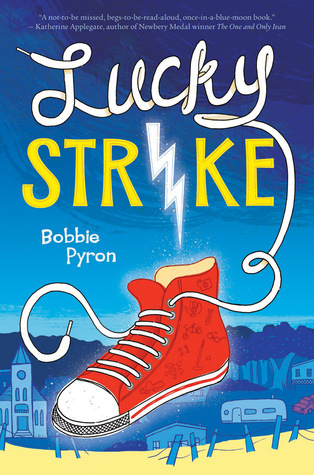 Lucky Strike by Bobbie Pyron is about Nate Harlow who lives with his grandfather in a trailer park down in Florida. Nate has always been unlucky and he thinks he always will be unlucky. He really wants this one prize but he thinks he won’t get it because he isn’t lucky enough to win it. His friend, Gen, who loves science, thinks that luck is really true but Nate doesn’t.On Nate’s birthday at the Goofy Golf mini-golf course, he gets struck by lightning and he survives it. Then the next day he fee Lucky Strike by Bobbie Pyron is about Nate Harlow who lives with his grandfather in a trailer park down in Florida. Nate has always been unlucky and he thinks he always will be unlucky. He really wants this one prize but he thinks he won’t get it because he isn’t lucky enough to win it. His friend, Gen, who loves science, thinks that luck is really true but Nate doesn’t.On Nate’s birthday at the Goofy Golf mini-golf course, he gets struck by lightning and he survives it. Then the next day he feels strange because all of the popular kids want to be his friends. Baseballs are drawn to his bat so he hits every baseball but before he couldn’t do that. The problem is that Nate could not be lucky forever as he wishes he could be. I would rate this book 5 stars. People who like mysterious books and fantasy/fiction because Nate feels unlucky and then one day he is popular and now is feeling lucky. What are the chances of being struck by lightning? Genesis Beam can answer that. Though it comes as no surprise that 11 year old Nate Harlow is struck by lightning and on his birthday nonetheless. He is, after all, the unluckiest person anyone in their small town of just over 700 people knows. So unlucky that his hound dog previously got snatched up and carried away by a tornado. So unlucky that Nate has never won a coin toss in all of his 11 years. The lightning strike changes Nate's luck thoug What are the chances of being struck by lightning? Genesis Beam can answer that. Though it comes as no surprise that 11 year old Nate Harlow is struck by lightning and on his birthday nonetheless. He is, after all, the unluckiest person anyone in their small town of just over 700 people knows. So unlucky that his hound dog previously got snatched up and carried away by a tornado. So unlucky that Nate has never won a coin toss in all of his 11 years. The lightning strike changes Nate's luck though and with that comes changes in Nate and Gen's friendship. This is a light hearted story with the power of friendship firmly at its centre. The aspects of small town living and nesting loggerhead turtles give this book a little more depth. I think kids in grades 4-6 will enjoy this one. Do you believe in luck? Good luck? Bad luck? Nate is certain he has the worst luck in the world, despite the rabbit's foot his grandpa gave him. Nate only has one friend...a weirdo as strange as Nate...but Gen, the smartest girl in town, absolutely does not believe in luck...only science and probability.A story of friendship, jealousy, the bad luck that comes with bad luck. A story of reaching past the comfortable, and doing what is right.The question, "do you believe in luck." is not definitive Do you believe in luck? Good luck? Bad luck? Nate is certain he has the worst luck in the world, despite the rabbit's foot his grandpa gave him. Nate only has one friend...a weirdo as strange as Nate...but Gen, the smartest girl in town, absolutely does not believe in luck...only science and probability.A story of friendship, jealousy, the bad luck that comes with bad luck. A story of reaching past the comfortable, and doing what is right.The question, "do you believe in luck." is not definitively answered...instead, the magic and luck are there for us to embrace or ignore. JF book that I read aloud to the rest of the family as we traveled Iowa. Nate Harlowe was always unlucky--until he got struck by lightning, and suddenly seemed to be the luckiest boy in town. His best friend is very analytical, and she doesn't believe in luck. The change in circumstance strains their relationship.I liked the way the author really grounded this book in a sense of place; it's definitely set in small-town Florida, and it shows in the details. I fell right into this beautiful story because I have been on the Sweet Jodie fishing boat and celebrated the Billy Bowlegs Festival. I love that this story has great characters who question everything from luck to science to friendship. I'm sure my fifth graders will enjoy this fast-paced story. I hope they are able to make connections and discover new questions as well. "If you are lucky enough to have a friend, you are lucky enough." Garrison and I read this book together for a book club group at the library. I really liked this book. The theme of friendship and what is most important in life was important for us to share together. I also enjoyed all the spiritualism in it. “Nobody is ever happy with what the lord has blessed them with.” A great line from the book. 3.5 stars. The 10-year-old and I liked this story but didn't love it. It takes place in our home state of Florida and touched on many themes familiar to us -- like sea turtles, sandy beaches, and hurricanes. I don't know why, but I'm really struggling to love some of these William Allen White Book Award nominations. :( Am I expecting too much? Is it me? Maybe I'll go into the next one with less expectations and maybe I'll enjoy it more. I really like the book because i loved the drama that happens and all the story changers. I love the books emotions. Not bad. Good themes and empathy. The ending was a little too “pat” for me. I think my 10 year old will enjoy it. I really enjoyed this book on the 2018 Sequoyah list. Of course it is completely unrealistic but also a great look at friendship and what it really means. Loved the premise of this Middle Grade novel. The characters were authentic, and I felt like I was in this small town. Loved this! Simply about true friendships and how true luck is having them. Fun book. It shows that too much of a good thing can be bad. This book was exciting. I think friendships are important, even if you make new ones. Just don't forget about old friendships. Serious things can happen when struck by lightning. I loved it because the characters Nat and Gen stick together no matter what happens.